Restore Oregon noted that two downtown buildings have been removed from the City’s Historic Resources Inventory. 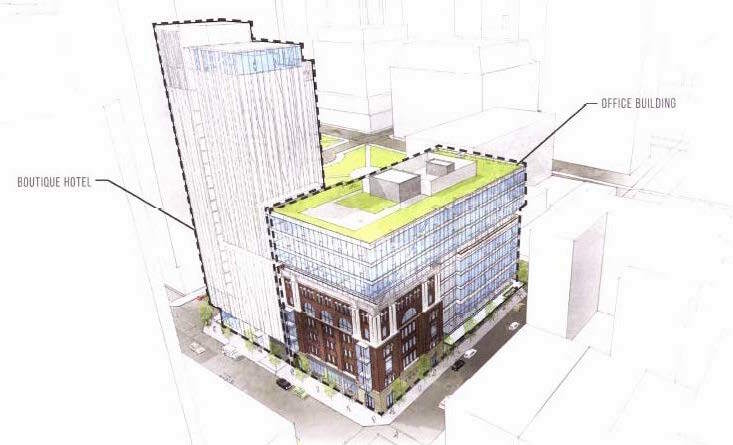 The buildings are on the site of a proposed mixed use development at 930 SW 3rd Ave, which will include a 20-story hotel and 10-story office building. As part of the development the Hotel Albion (which includes the Lotus Café and Cardroom) will be demolished. The Ancient Order of United Workmen Temple Building will be incorporated into the development will also be demolished. 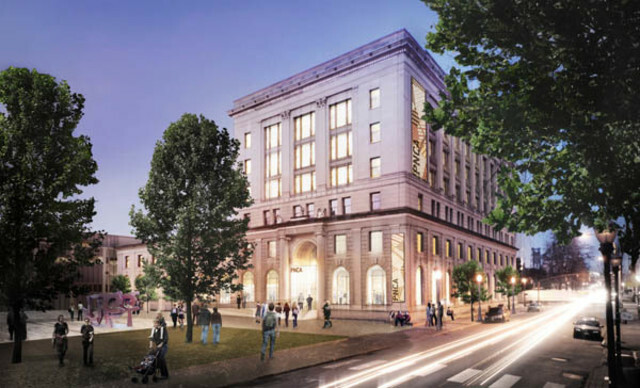 In a 5-0 vote, the Portland City Council adopted the Broadway Corridor Framework Plan, which will form the vision for how the 14 acre Post Office site in the Pearl will be developed. The acquisition of the site, worth between $135 and $177 million according to developer Mark Edlen, will cost the City up to $80 million. Construction will begin by the end of the year on the 299 room Porter Hotel at SW 2nd and Jefferson. The 16 story building will be included in Hilton’s “Curio” collection of hotels. The Society Hotel opened this week in Old Town / Chinatown. The Portland Mercury published photos of the low cost hotel meets hostel, and described the “gorgeous rooftop deck” as the project’s “crowning jewel”. Shortly after acquiring trucking company Conway, XPO Logisitics laid off 101 Portland based workers. Though headquartered in Ann Arbor until its acquisition, Conway was a large landowner in Northwest Portland. What effect, if any, the acquisition will have on the redevelopment of the Conway Masterplan area is currently unclear. Kaiser is planning a 700 space parking garage at 500 NE Multnomah in the Lloyd District. According to BikePortland the structure “aims in part to free up space on Kaiser’s other parking lots, which could then be developed or sold in order to continue the surge of big developments [in] the Lloyd District”. The Portland Chapter of the AIA held its annual design awards last weekend. Portland Architecture wrote about the winning projects, which included Lever Architecture’s Treehouse and Allied Works’ PNCA 511 Building. In a post titled ‘The City of Fabric Buildings‘ Places over Time noted how curious it is that “Portland has developed such an international reputation as a city without the assistance of any real place-specific visual aides”. Design work is about to start on the Multnomah County Health Dept HQ, which will be located on a site near Union Station. The new building will be “nine stories and run between $85 million to $95 million” according to a report in The Oregonian. Portland Monthly reported that health food “haven” Prasad opened a second location at the Portland Rock Gym, which recently completed a major expansion. NOTE: This post has been revised to reflect that the Temple building will be demolished, as shown on drawings published on the City Auditor’s website Monday. Multnomah County chose the site at the Hawthorne Bridgehead as the site for the future Multnomah County Courthouse. The Portland Business Journal published photos of the under construction One North development on N Williams Ave. 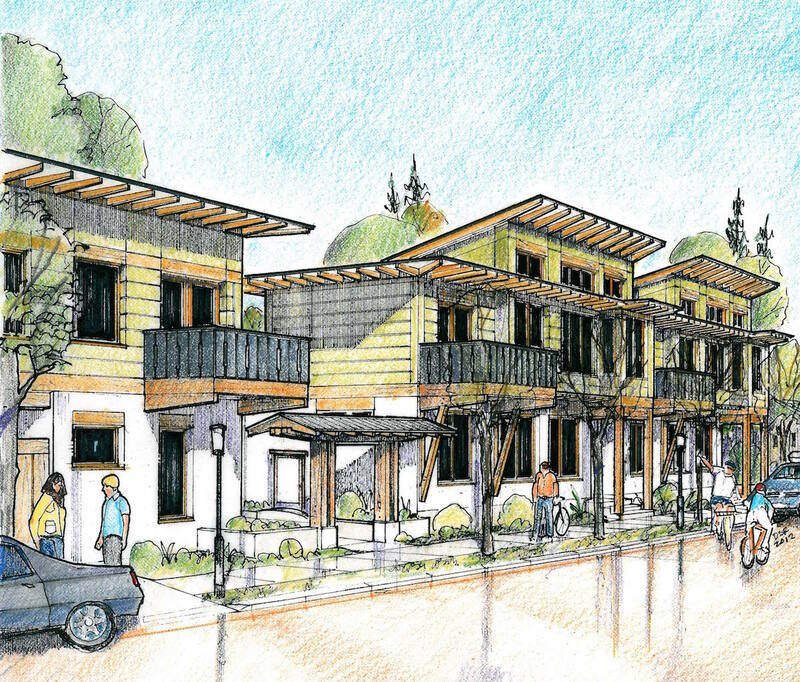 The Oregonian looked at how the recently completed Ankeny Row incorporates sustainable design into a project designed for retirees looking to downsize. Running over budget, the Franklin High School Modernization has gone through a $20 million value engineering exercise. The City intends to buy Block 26 from Hoyt Street Properties for $1.3 million, a price 13% below market value. The Pearl District property will be used for an affordable housing project. BikePortland looked at the ‘beautiful’ bike parking at the PNCA 511 Building. With just a few weeks to go until the Hotel Eastlund opens, the Portland Business Journal had a look at the progress. 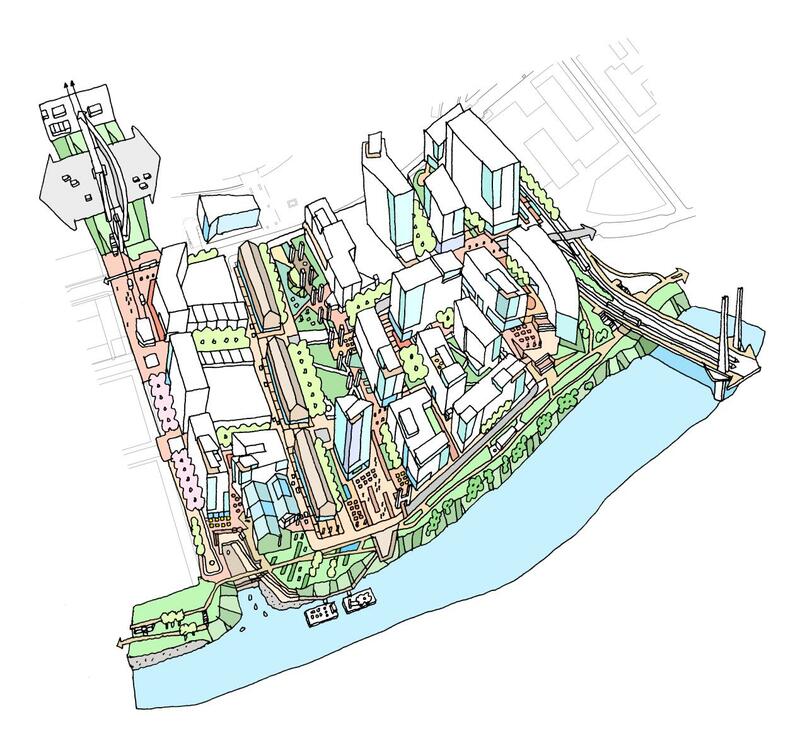 Image from the West Quadrant Plan showing a possible development scenario meeting targets for approximately 20,000 new housing units and 30,000 new jobs. In a 4-1 vote the City Council approved the West Quadrant Plan which will shape the development Downtown, South Waterfront, the Pearl and Goose Hollow for the next 20 years. The lone no vote was Amanda Fritz, who stated that she was “disgusted” at the way the hearing was conducted. The public got their first chance to see the PNCA 511 Building when it opened for its first First Thursday event. At Portland Architecture Brian Libby writes about his experience of visiting PNCA’s “transformational new home” now that it’s finished and the students have moved in. The Portland Mercado has set an opening date of Saturday, April 11. The market will include food cart vendors from regions of Mexico, Colombia, Cuba, Argentina and El Salvador. After years where South Waterfront was a retail desert, Urban Works Real Estate is now reporting that they are running out of space to offer in the district. They recently announced that have leased the entire 14,000 square feet of retail space at The Ardea. The Portland Chronicle published photos of the stretch of N Williams / N Vancouver on which the Cook Street Lofts, The Woods and the Cook Street Apartments are all either planned or under construction. They noted that “between the two blocks 360 residential units are in development on property formerly home to three residential dwellings”. The Oregonian published two articles about the Oregon Square development. The first article focused on the proposed public plaza, and quoted Kyle Anderson of GBD Architects who said that they “definitely see it as being both an amenity and asset to the development, but also a destination.” The second article revealed that that the tower might be the first building in Portland to undergo a peer review of its seismic design, instead of using the prescriptive requirements of the building code. Chad Rennaker’s Palindrome Communities won the development rights to Lents Town Center Property #1 and Property #2. The Portland Tribune wrote about his plans for Lents, which also includes the Z Haus brewpub and restaurant. 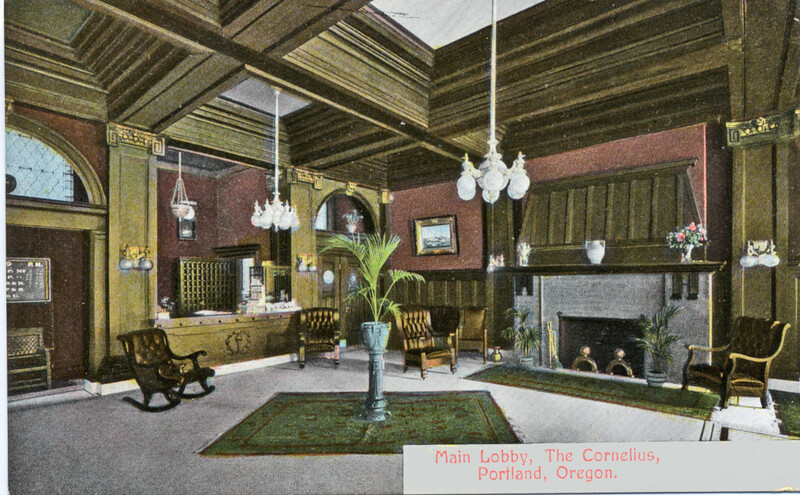 Hotel Cornelius Lobby (image via Portland Preservation). The interior no longer remains. The Portland Design Commission this week reviewed Hazelwood Plaza and offered Design Advice on Modera Belmont. The Oregon confirmed that the adjacent Woodlark Building and Hotel Cornelius will be converted into a hotel operated by Provenance Hotels. A Pre-Application Conference for the project was held in December. The Zipper, Guerrilla Development’s latest project, is taking shape on NE Sandy. The collection of micro-restaurants will open in March. Portland Architecture published photos of Colab’s recently completed Ankeny Lofts 2/3. The 657-unit, three-building Hassalo on Eighth project will have a topping off ceremony on Monday, with Mayor Charlie Hales and Congressmen Earl Blumenauer present. The Portland Chronicle published construction photos of Urban Development Group’s 27th & Ankeny project. Randy Gragg asked whether the PNCA 511 Building will spark a renaissance in Old Town. The first students moved into the building this week. The Portland Business Journal had a look at the under construction Erickson Saloon & Fritz Hotel project. New Seasons has pre-leased 15,000 sq ft retail space in the Cook Street Apartments, to address a parking shortage at their North Williams store. Hacienda CDC has a number of community projects in progress on the east side, including the Portland Mercado. The Design Commission approved designs for Block 136 and the 19th & Overton. The Portland Development Commission is moving working on finalizing a Development Agreement with ZRZ Realty for Zidell Yards. The Portland Business Journal reported that the main areas still to be worked concern affordable housing and a new park. The Oregonian obtained a draft memo from the Portland Housing Bureau, which asked whether the Zidell family had “no desire” to develop affordable housing. Beneficial Bank is considering redeveloping property it owns at 430 NW 10th Ave in the Pearl with an 11-story wood building. The property is currently occupied by a branch of Albina Bank. Construction is underway on the Burnside Bridgehead Block 75, designed by Works Partnership. The Portland Business Journal reported that a formal groundbreaking is scheduled for Thursday January 29th. The Portland Chronicle published photos of the church at 5000 SE Lincoln set to be demolished, to allow the construction of new townhomes. A 2,000 sq ft visitor center at the Oregon Zoo Elephant Habitat will be the first building in the state to use Cross Laminated Timber, as reported in the Portland Business Journal. Brian Libby of Portland Architecture had a first glimpse of the PNCA 511 Building, set to open soon. Next Portland published an article about the building earlier this week. The Pacific Northwest College of Art’s 511 Building, officially the Arlene and Harold Schnitzer Center for Art and Design, is nearly ready for students to move in. The building on the North Park Blocks will be the new home for PNCA. Originally constructed in 1918 as the city’s main post office, it was designed by San Francisco architect, Lewis P. Hobart. The building was most recently occupied by the Department of Homeland Security. The renovation has been planned since 2008, when the Federal Government reached an agreement with PNCA to give the building away at no charge.